Exciting, nostalgic, motivating and meaningful are words one might use to describe the homecoming tradition and show put on each year by the University of Utah’s marching band, the Pride of Utah. The Script Utah show is a one-of-a-kind performance that prepares audiences for the anticipated homecoming games. The band stands in a long line, folding back and forth on the east side of the field as they perform some of the university’s fight songs, all while forming the iconic name, “Utah” in cursive. Students, fans, and alumni look forward to this highly anticipated pxerformance. 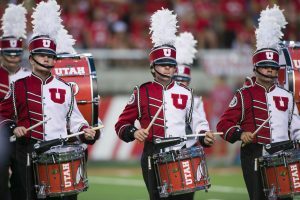 The University of Utah Marching Band performed in an NCAA football game vs. Washington at Rice-Eccles Stadium in Salt Lake City, UT on Saturday Sept. 15, 2018. This show has been running since the 1950s when it was directed by then-band director Robert Gregory . 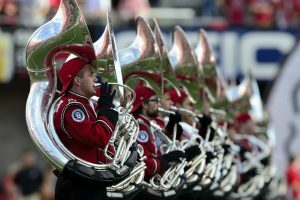 Prior to directing for the U’s Pride of Utah band, Gregory spent time at the high-ranked marching band college, Ohio State University. He brought the concept of Script Utah to life when he became the director. With a legendary show comes great preparation from all those involved in performing. 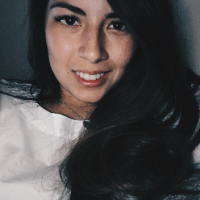 The show is typically learned by band members in a week. Despite appearances, forming curves in a marching band isn’t the easiest choreography. Each band member has to perfectly memorize their small spot on the field that they need to move to. They also need to know how many steps or music counts it takes to get there and how they fit into the picture. Then they need to memorize their individual parts to the music and how it fits into the ensemble. After all of that, they need to execute everything they’ve memorized simultaneously while maintaining clean musical and marching techniques. The picture is a little bit different for the line of drummers that keeps the band in time. U alumnus and drumline section leader for 2016 and 2017, Ron Totman, recalls his experiences of preparing for the show. Script Utah is learned and rehearsed like any other type of show, just in less time. Mourdock continued to describe how she helps the band prepare. 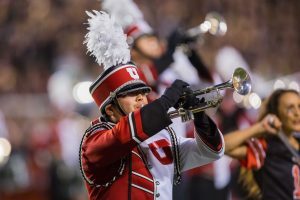 Totman was involved in the band program for all four years that he attended the U in his undergrad and performed the Script Utah show in all four. Members of the Pride of Utah find being a part of the band and particularly the homecoming event to be a personal honor. With the Script Utah show being a well-known tradition, they take the performance to heart. Greer is one of four students taking on this year’s title of drum major. Voted on by the band and then chosen by the director, Greer conducts the Pride of Utah Marching Band. Of all the shows performed, some stand out more than others for various reasons. Whatever it may be, the performances give nostalgic feelings to the band members. Band members past and current consistently find awe in their first performances. Sadly, all shows must come to an end. 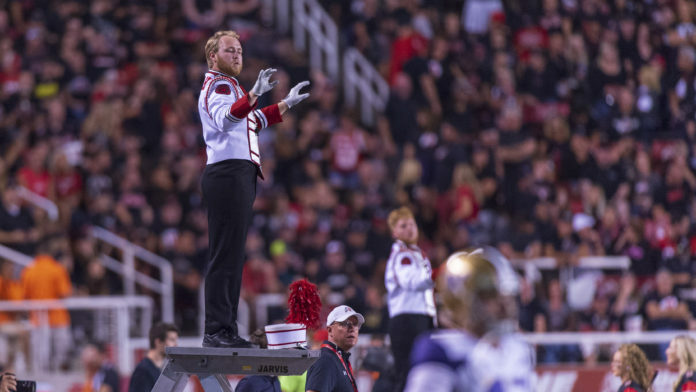 While some members of the Pride of Utah will be performing their final Script Utah show this homecoming and others will march their first time, they’re advised to live that moment to its fullest.